Let's talk ceiling fans! It's not quite hot enough yet to where we really need a ceiling fan right now but those summer months are lurking right around the corner and we can't go another summer without fans. I like the look of the Mondrian fan but I wish the wood colored blades were a little darker. The description says that the blades are maple on one side and black on the other so I could always flip them to the black side instead. Keep in mind that there's at least 2-3 feet of wall not shown above the windows so the fan would actually hang much higher than it's pictured. 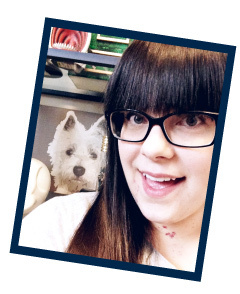 I lovvve the style of this fan and its $99 price tag makes my heart pitter patter even more! I think it's super sleek and modern looking but wonder if it would carry too much visual weight on the ceiling? We do have 10' ceilings on the first level and 9' ones on the second level so I think it could work! Think your eyes can handle another comp? The brushed pewter fan shown above is the same as the black one except it has a brushed pewter finish (obviously) and the blades are reversible to maple and white. If I were to get it, I'd have the white blades showing instead of the maple ones. It's also $99 which is great! Ehhh, I don't know. It feels a little "blah" and flat in the photo but maybe it'd look better in person! 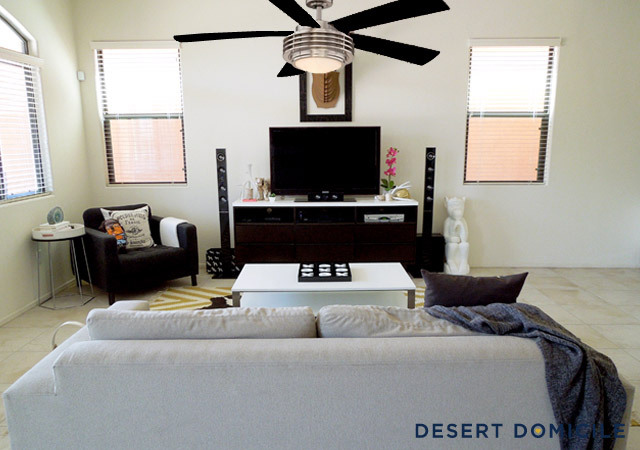 I wish it was possible to DIY a ceiling fan! I vote 3, with the white blades. My other suggestion would be to go totally obvious and embrace the ceiling fan....like maybe a plantation style with nice woven blades? (I've always wanted one of those!). Not sure if you can find one with an un-ugly light fixture though. I like #1 & leaning towards the black blades. Also, I think darker blades are a bit easier to keep clean. (But maybe you're a better housekeeper than I?). Kelly - I saw a really nice outdoor fan at Lowe's that had some nice woven blades but it was in the $300 range if I remember correctly. They also had a nice 2-blade modern one a while back but it got horrible reviews and sold out super fast. I was planning on buying one to see what all the fuss was about but it sold out faster than I could get my hands on it. Girl, I'm right there with you. I do not love the look of ceiling fans, but they are an absolute necessity. I really like #1. I like the black options. They appear to look really good in your space. Unicorn fan. Too funny. I am leaning toward number 2, personally. :) The ceiling fan in our master bedroom is my favorite part of the empty room. Haha. The ceiling fan in my daughter's room was around $50 and has that "typical" ceiling fan look, but it does the best job of cooling the room quickly. I love it! Kudos to you going against the "design grain." Function over form any day! I like #2 the most. Bust if you are wanting it to blend away, visually, then #3. Question...do you need/want the light? I think the light adds visability to the fan. If you are comfortable with your room lightings now, then choose something without the bulky looking light. Just a thought. We totally need a new ceiling fan in our living room! I am having the hardest time too. I just don't like very many - but like you it is pretty necessary during the summer. Anything though would be an upgrade to what we have now :). I really like the second one - and the price is a great bonus!! Thanks for sharing! oooh, i really like the last pic with the white blades. looks clean and crisp! I am also in the market to purchase a fan for our bedroom, we just all the bedroom wired for ceiling fan with light,we had nothing before. Anyway I am looking at your first choice too, I like the steampunk look it has, it reminds me of "Dune", the movie version! I also read it is dimmable, good for a bedroom, may be not so much for your room. We have installed 2 fans last week, one totally white which blends in the room, and another one similar to your second choice, it has a lot of presence but it seems to complement the room, so ....may be go with the one you love! Enjoy the upcoming cool air! I'm going to go with #3 since it will blend in more. I was actually looking up at our ceiling fan the other day and thinking about painting the blades white so they blend in with the ceiling more. My husband looked at me like I was nuts... as usual.